Are you ready for NBA season yet? As a DFS player, I always get a weird feeling after baseball season finally ends. NFL becomes the main focus of everyone’s bankroll, thus leaving lots of downtime until NBA gets started. However, I feel it’s a great opportunity to get a head start on NBA season and prepare for the opening tipoff. If you are getting started with daily fantasy basketball, then this article will help you shorten your learning curve and build optimal lineups that cash in 50/50 contests and win a GPP or two. How does daily fantasy basketball work? Daily fantasy basketball allows players to draft a team of players for each schedule day of games and win prizes based on how many points your team scores. Players receive points based on real life performances from players on your current roster. Since most players play on Fanduel & DraftKings, I am going to use their scoring system and roster construction as the main example for this article. For more Fanduel NBA help, refer to my previous article: Fanduel NBA Strategy Guide. I’ve been a fan of the NBA for decades now so my strategy involves researching stats, looking at projections, analyzing points allowed per position, and watching live NBA action. 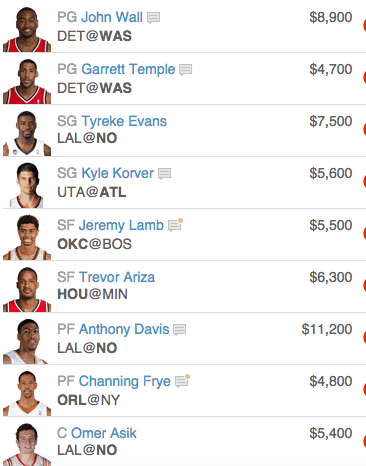 All of these components help me build lineups for 50/50, Head to Head, and GPP contests. I am mostly a GPP player but will probably focus more on cash games since I plan to scale my gameplay during the 2015/16 season. Why is this important to you? Because you should figure out your own personal strategy when entering DFS basketball contests. Once you develop your personalized strategy, then you will find it easier to create lineups on the fly. Gaining an understanding of players and matchups will cause the best plays of the night to jump out at you and scream PLAY ME. However, you should always follow some basic advice to keep your game sharp. Another way to check starting lineups is by using twitter. All 30 NBA teams post their startling lineups on twitter around 30 minutes before tipoff. Here’s a list of every NBA team’s twitter feed. Remember this basic tip: Minutes = Opportunity = Money. More minutes means more chances for points, assists, rebounds, and steals.